Rev. W.F. Ulery came to Fargo in 1885 to start a Lutheran church whose services were done in English as all of the services offered in the area where in the people’s native tongues. He persuaded the Southern Railway Depot to allow him to use their building to teach Sunday School. During his two years of teaching Sunday school he raised the $2,000 needed to build a church proper on a three lots on the corner of 8th street and 4th Ave north. 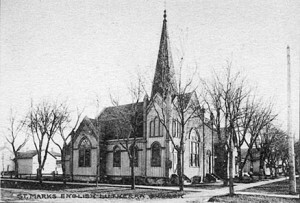 The construction on the church started on July 25, 1886 and the first service was held on May 18, 1887. There were 10 members of the congregation at that time.